Aims: This study aims to determine the diagnostic efficacy of microsatellite markers for screening bladder cancer in population at high risk. Materials and Methods: A population of 200 people was screened for bladder cancer using a set of microsatellite markers. Urine samples were obtained from four different types of population groups – Group 1 (healthy population group), Group 2 (current smokers with a smoking history of more than 10 years), Group 3 (bladder cancer group), and Group 4 (bladder cancer group who were former smokers with a history of more than 10 years). Polymerase chain reaction (PCR) was performed to amplify microsatellite sequences at D9S63, D9S156, and D9S283. 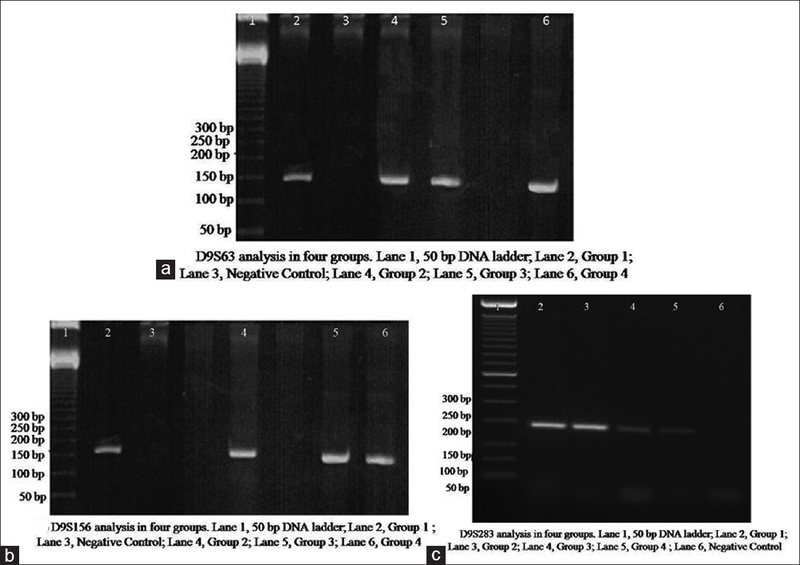 PCR products were separated on 1.8% agarose gel and were scanned using ultraviolet transilluminator. Results: In Group 2 (high-risk population group, mainly current smokers with a history of more than 10 years), microsatellite alterations were found in 36 out of 50 people. We observed microsatellite alterations in 38 out of 50 people in Group 3 (bladder cancer group) and in 39 out of 50 people in Group 4 (bladder cancer group, mainly former smokers with a history of more than 10 years). The sensitivity of this test in Group 2, Group 3, and Group 4 was found to be 72%, 76% and 78%, respectively. The specificity of this test in each group was found to be 90%. Conclusion: Using these set of microsatellite markers, medium sensitivity and high specificity were reported for this test. The current findings suggest that a set of microsatellite markers (D9S63, D9S156, and D9S283) can be used to detect bladder cancer in high-risk population. Microsatellites are simple sequence tandem repeats of di-, tri-, or tetra-nucleotides. Microsatellite instability can be easily detected using polymerase chain reaction (PCR). Microsatellite markers play a significant role in the analysis of loss of heterozygosity (LOH) in bladder cancer. Bladder cancer is the ninth most common cancer in the world. It involves neoplasm of the urinary tract. Studies on urothelial bladder cancer have revealed various risk factors. The two most significant risk factors for bladder cancer are cigarette smoking and occupational exposure to urothelial carcinogens. LOH is commonly found on chromosomes 4, 5, 8, 9, 11, and 17 and can be considered as a frequent event in bladder carcinogenesis. Loss of genetic material on chromosome 9 is a candidate initiating event for bladder cancer and is found in 60% of bladder cancer cases. Primary chromosomal mutations lead to the initiation of bladder cancer whereas secondary chromosomal aberrations lead to its growth at a more progressive stage. Patients were asked to collect about 40 ml of midstream urine in the morning with as little contamination as possible. 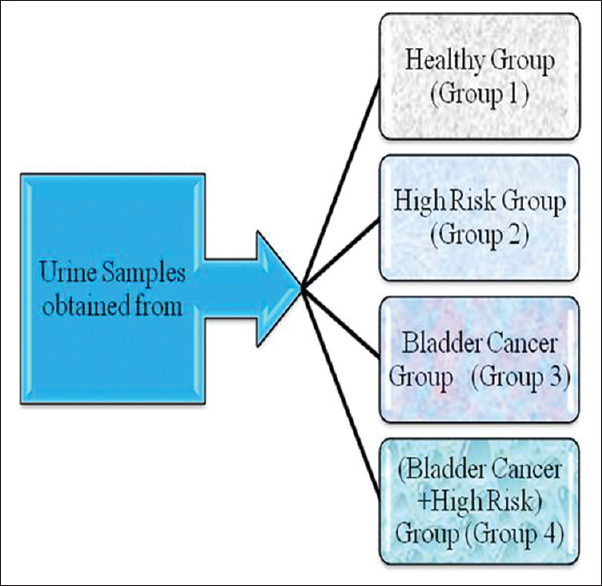 Urine samples were collected from four different groups [Figure 1]: Group 1 (healthy population group), Group 2 (current smokers with a smoking history of more than 10 years), Group 3 (bladder cancer group) and Group 4 (bladder cancer group who were former smokers with a history of >10 years). The collected urine sample (20 ml) from each group was then centrifuged for 20 min at 12,000 rpm at 4°C. The supernatant obtained was discarded carefully in a solution of 1% sodium hypochloride. The pellet obtained was resuspended in 5 ml phosphate-buffered saline (PBS), vortexed, and then, the mixture was finally centrifuged at 12,000 rpm for 20 min at 4°C. The pellet obtained was stored at −20°C until further use (in case DNA extraction not proceeded on the same day). DNA extraction was done by QIAamp DNA Mini Kit according to manufacturer's recommendations. The pellet was liquefied by adding 200 μl of PBS solution, followed by gentle vortexing. A volume of 200 μl of sample was added to 20 μl of QIAGEN Protease (Proteinase K) in a 1.5 ml microcentrifuge tube. Next, 200 μl of Buffer AL was added to the mixture and mixed thoroughly. The mixture was then incubated at 56°C for 10 min and centrifuged briefly to remove the drops from inside. The mixture was then loaded to QIAamp spin column (Qiagen) and was centrifuged at 8000 rpm for 1 min. The filtrate obtained in 2 ml collecting tube was discarded. Then, 500 μl of buffer AW1 was added to QIAamp spin column and was centrifuged at same rpm for 1 min. The filtrate obtained in the tube was discarded. The wash procedure was repeated by adding 500 μl of buffer AW2 to the spin column and centrifuging at 14000 rpm for 3 min. The filtrate obtained in the tube was again discarded. Finally, 200 μl of buffer AE was added to the spin column and was centrifuged at 8000 rpm for 1 min. The elute containing the pure genomic DNA was stored at −20°C. PCR amplifications were performed using 10–20 ng of genomic DNA in a final volume of 50 μl in a thermocycler. Thawed control DNA samples, PCR Master Mix and ISSR primers were spinned briefly and kept on ice bucket. Master Mix for ISSR PCR was prepared separately each time for D9S63, D9S156, and D9S283 microsatellite markers, respectively, according to manufacturer's recommendations (Helini Biomolecules) as shown in [Table 2]. Prepared master mix was mixed and spins down briefly. Polymerization profile used for the amplification with ISSR primer sets is shown in [Table 3]. Confirmation and identification of the PCR product were carried out on 1.8% agarose gel as per manufacturer recommendations (Helini Biomolecules). Agarose gel was prepared in 1X tris acetate EDTA (TAE) buffer by boiling 0.9 g of agarose in 50 ml of 0.5X TAE buffer and cooled to 50°C. 10 μl of 50 bp DNA ladder (Invitrogen) was loaded into the first well. As PCR master mix was premixed with the dye and sediment agent (Helini biomolecules), 10 μl of PCR product was directly loaded into the gel. The electrophoresis was carried out at 70V for 60 min. The gel was then scanned by the ultraviolet transilluminator for the presence of PCR product. Urine is an important tool for the clinical diagnosis of bladder cancer. Smoking is a known risk factor” and bladder cancer occurs in many nonsmokers too. In addition, it has an association with tobacco. Primary efforts for bladder cancer screening involved the estimation of blood in urine. Importance of microsatellite instability as a biomarker was first manifested for bladder cancer. To study the role of microsatellite instability for screening bladder cancer in high-risk population, the presence of additions or deletions in each of microsatellite loci were tested. A total of 200 people including all four groups: Group 1 (healthy population group), Group 2 (current smokers with a smoking history of more than 10 years), Group 3 (bladder cancer group), and Group 4 (bladder cancer group who were former smokers with a history of more than 10 years) were enrolled in this study. In this investigation, a panel of three microsatellite markers situated on chromosome 9 was used to screen bladder cancer in the high-risk population. Urine was used as a medium for noninvasive diagnosis of bladder cancer. The positive control (healthy group) confirmed the presence and PCR product size of the marker. Negative control was loaded in each case to confirm absence of cross-contamination during the extraction process. The presence of D9S63 (153 bp), D9S156, (177 bp), and D9S283 (192 bp) microsatellite alterations were analyzed in all four groups. By comparing the sample bands to the control bands, instability at D9S63, D9S156, and D9S283 loci were observed in each case [Figure 2]. The efficacy of any urine-based assay depends on its sensitivity and specificity. An ideal biomarker should have high sensitivity and specificity to accurately detect bladder cancer. The efficacy of microsatellite instability was tested by calculating its sensitivity and specificity for this test which was calculated using following formulae. The shift in bands observed in Group 2, Group 3, and Group 4 in all the above cases indicated alterations at D9S63, D9S156, and D9S283 microsatellite loci. In Group 2 (high-risk population group, mainly current smokers with a history of more than 10 years), microsatellite alterations were found in 36 out of 50 people. We observed microsatellite alterations in 38 out of 50 people in Group 3 (bladder cancer group) and in 39 out of 50 people in Group 4 (bladder cancer group, mainly former smokers with history of more than 10 years). Sensitivity and specificity of this test were calculated using the data [Table 4] for determining the efficacy of this analysis to screen bladder cancer in three different types of population. The sensitivity of this test in Group 2, Group 3, and Group 4 was found to be 72% (36 out of 50 people), 76% (38 out of 50 people), and 78% (39 out of 50 people), respectively. The specificity of this test in each group was found to be 90%. The previous studies have reported sensitivity of 85% and specificity of 90%. The sensitivity of these markers can be further increased using more suitable set of microsatellite markers in combination with these markers for microsatellite alteration analysis. The current findings also support previous studies regarding its sensitivity and specificity. The sensitivity obtained in this study is slightly less than the reported sensitivity from earlier findings. The major finding emerges from this study is high specificity and medium sensitivity of this test. This suggests that the combination of the three microsatellite markers (D9S63, D9S156, and D9S283) can be used for the prognosis of bladder cancer in population at high risk. The sensitivity of this test can be further increased using more suitable set of microsatellite markers in combination with these markers for microsatellite alteration analysis. The present investigation is a way to diagnose bladder cancer noninvasively at an early stage in high-risk population. On the basis of the findings obtained from this current study, it has been clearly indicated that a set of microsatellite markers D9S63, D9S156, and D9S283 can be used to detect bladder cancer in high-risk population. Using these set of microsatellite markers, medium sensitivity and high specificity were reported for this test. Using more suitable set of microsatellite markers in combination with these three microsatellite markers, the sensitivity of this test can further be increased. The current study is a way to diagnose bladder cancer noninvasively at an early stage in high-risk population. As per the findings of the present investigation, the combination of D9S63, D9S156 and D9S283 can be used clinically as a first choice marker for microsatellite analysis. Improved use of new urine-based tumor markers should be emphasized since they could represent an immediate, efficient screening tool in patients already identified at higher risk due to the presence of microhematuria during routine urinalysis. The authors are thankful to Dr. Swati Jain, University of Colorado, Denver Miss Rashmi Gwal, Dygnogene, Bhopal for their constant support throughout the research work. This study was financially supported by Rajiv Gandhi Proudyogiki Vishwavidyalaya, (State Technological University of Madhya Pradesh), Bhopal. Ellegren H. Microsatellites: Simple sequences with complex evolution. Nat Rev Genet 2004;5:435-45. Gonzalez-Zulueta M, Ruppert JM, Tokino K, Tsai YC, Spruck CH 3rd, Miyao N, et al. Microsatellite instability in bladder cancer. Cancer Res 1993;53:5620-3. Ploeg M, Aben KK, Kiemeney LA. The present and future burden of urinary bladder cancer in the world. World J Urol 2009;27:289-93. Pasin E, Josephson DY, Mitra AP, Cote RJ, Stein JP. Superficial bladder cancer: An update on etiology, molecular development, classification, and natural history. Rev Urol 2008;10:31-43. Utting M, Werner W, Dahse R, Schubert J, Junker K. Microsatellite analysis of free tumor DNA in urine, serum, and plasma of patients: A minimally invasive method for the detection of bladder cancer. Clin Cancer Res 2002;8:35-40. Jung I, Messing E. Molecular mechanisms and pathways in bladder cancer development and progression. Cancer Control 2000;7:325-34. Vaish M, Mandhani A, Mittal RD, Mittal B. Microsatellite instability as prognostic marker in bladder tumors: A clinical significance. BMC Urol 2005;5:2. Berger AP, Parson W, Stenzl A, Steiner H, Bartsch G, Klocker H, et al. Microsatellite alterations in human bladder cancer: Detection of tumor cells in urine sediment and tumor tissue. Eur Urol 2002;41:532-9. Shariat SF, Karam JA, Lotan Y, Karakiewizc PI. Critical evaluation of urinary markers for bladder cancer detection and monitoring. Rev Urol 2008;10:120-35. Lotan Y, Svatek RS, Malats N. Screening for bladder cancer: A perspective. World J Urol 2008;26:13-8. Sidransky D, Von Eschenbach A, Tsai YC, Jones P, Summerhayes I, Marshall F, et al. Identification of p53 gene mutations in bladder cancers and urine samples. Science 1991;252:706-9. Wadhwa N, Jatawa SK, Tiwari A. Non-invasive urine based tests for the detection of bladder cancer. J Clin Pathol 2012;65:970-5. Arisan S. The importance of molecular tumor markers for bladder cancer. Turk J Cancer 2003;33:171-6.